The most unforegetable journey with your loved one is the tour to the land of snow-capped mountains, thick lush forests, pristine beauty of the nature and enjoy a honeymoon in Himachal Pradesh. As truly called Honeymooner's Paradise the state of India has has some of the best landscape and due to its varied topography. So, come and relish the view of the snow-covered peaks, exuberant valleys, deep gorges, and grasslands with thick growth of flowers and cool flowing rivers with honeymoon in Himachal. Not only this the Himachal Pradesh Provides other adventure sports as well like Paragliding, Zorbing,Trekking, Skiing, village tourism, outdoor camping, river rafting Mountain biking and other winter sports or simply relaxing with honeymoon in Himachal Pradesh. Not only honeymoon or adventure one come here to escape from scorching heat of the plain during peak summer season. Almost all os the towns of Himachal Pradesh is therefore good hill station. Shimla: This summer capital of British India is situated at an altitude of 2159 mtrs above sea level. Mainly popular for splendid summer vacations among plain tourist. The most visited part of this town is the Mall, Chail, Kufri. The beautiful hill station is also one of the most preferred destinations for honeymooners from around the country. The tourist visit here from across the country one of the most fascinating is access by narrow guage train. Naldehra about 25 km from shimla is popular for a nine hole golf course, located on a gradual slope on scenic hill top surrounded by fir trees, and a picnic ground on hilltop. Manali: Manali in Himachal Prasdesh which lies in the lap of the Kullu valley is one of the most visited tourist spot for honeymooners and others alike. It is located at an altitude of 2050 meters above sea level and is spread along the banks of the river Beas. Manali derived its name from Manavalaya meaning the abode of Manu or "Home of Manu" and here, the temples are treated as pilgrimages. Its cool atmosphere provides a perfect haven for the ones afflicted by the hot Indian summers. Manali is also famous for adventure sports like skiing, hiking, mountaineering, para gliding, rafting, trekking, kayaking, and mountain biking. Manali is quite famous for its lush green forests of deodar and snow capped mountains. There are many attractions in and around Manali some of them are Kullu Valley, Hadimba temple, Manu Temple, Manikaran, Rohthang Pass, Vashist Hot water spring and temples, Solang valley perfect for winter sports. Dalhousie: Dalhousie is an interesting hill station as you have not much to do other than enjoying the beauty of the place with the Dhauladhar range on the backdrop. Situated on the eastern part of River Ravi, rafting is an important activity during the summer time. There are colonial buildings and low-roof homes of the British era. The prime attraction of the place is the Jandhri Ghat, a palace surrounded by tall pine trees. Kasauli:Covered by most beautiful pine forest and hill mountains it is one of the most sought destination coser to Chandigarh & New Delhi. This is alsa most popular weekend getaway for these cities. This pretty little hill town is ideal for long walks along wild-flower-hedged winding roads. Kasauli provide a charming view of Chandigarh, Shimla and the himalayas covered with snow. It's main ttraction lies in it's overall cleanliness, and it's accessibility. Kasauli is a pleasant alternative to staying in Shimla; it is devoid of its crowds and is still close enough. Kufri: Kufri is famous for winter sports here Hiking, Skiing and trekking if very much popular from November to March. A journey of around 19 km from Shimla would take you to Kufri, a small hill station. Pony and Yak ride, stay a resort, and go on a trip to the nature parks. Chamba: Chamba one of the oldest princely states and lesser known destination for honeymoon couple. Chamba dates back its origin to 6th century AD. The town of Chamba is located in the colorful valley surrounded by the Shivalik ranges. Kangra : Kangra is a small town and was the capital of the erstwhile rulers of the Chand dynasty. The hill station is placed at the foothills of the mighty Dhaulandhar range its pristine untouched beauty is impeccable. Khajjiar : Khajjiar a modest grass-covered meadow located in the enchanting valley of Chamba, is an ideal getaway for picnic while traveling between Dalhousie and Chamba. The most preferred for a honeymoon couple and there are facilities of horse riding & other adventure activities. 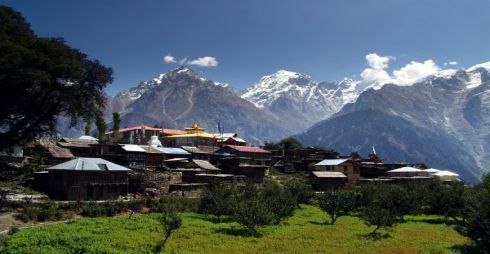 Kinnaur : Kinnaur is a land of rich green valley, ripe orchards, vineyards, snow-covered peaks and cold desert mountains. Ideal for adventure sports like trekking, mountain climbing. Due to high altitude there is drastic change in culture and climate both.